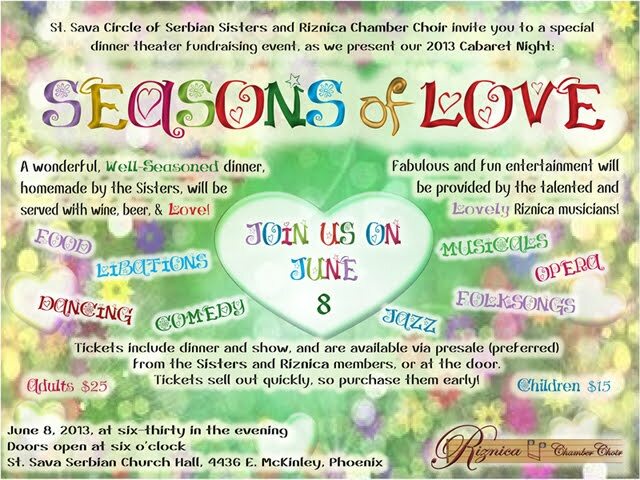 Once Again, Riznica Chamber Choir and the St. Sava Circle of Serbian Sisters (Kolo Sestara) have joined efforts to bring you a wonderful evening of fun, food, laughter, drinks, music, and entertainment! Get ready to partake of a wonderful meal—complete with soda, beer, and wine—prepared and served by the Sisters. Take a break, and browse silent-auction items available. Once your belly is full, get ready to be entertained by the talented entertainers of Riznica Chamber Choir. Because seating is cabaret-style, with a sit-down dinner, the total number of tickets is limited! Purchase your tickets here, now, or from one of the Sisters or Riznica members as soon as possible.